I see my one (ONE!) lonely post from last year and I think “I know, I’ll write about my Internet connection in Mexico!” But try as I might, I can’t make it funny or interesting. So just know this, Dear Reader, that I have a bad one. I swear it got much worse this year, although it didn’t seem possible. Like – No Uploading, Ever bad. The first time I put on my headpiece each year is just seems so BIG! Galileo is in SoCal for our annual Posadas Dinner Party gig at La Golondrina in the old, historic part of Los Angeles, and instead of writing about farming in Mexico or other exciting details of our busy life (you think I’m kidding, don’t you? ), I’m going to give you a glimpse into the life of us two professional musicians. This is the sculpture at the Tijuana border. I think it’s imposing but ugly. I am seated at a desk in a hotel room – the same hotel we have stayed in for several years now. It’s not glamorous. Many of you would not choose to stay here. But it’s clean (enough) and safe (enough), has internet (see above – this is why some of my friends and family only hear from me in December!) and we’re used to it. Enough about the hotel. We’re notorious penny-pinchers. We travel a full day to get here each year, leaving Central Mexico and the central time zone early in the morning, arriving at the border still in the morning in a new time zone, getting across said border, renting a car in San Diego and driving to the Los Angeles area and haggling over the price of the hotel. (Bet most of you didn’t realize you could do that). We usually have one or two days to get acclimated. I got to see my friend Chris. Flannel twins. Practice: maybe you thought that practicing is for beginners. Practice is for all musicians, all the time. All through the year we practice, learn, and rehearse. For us that involves setting up equipment, as we don’t usually practice with acoustic instruments. Since Chon is a composer, we learn new songs throughout the year, to archive them, or to prepare them (arrange and organize) for live performances. Some weeks we have to put our farming schedule first, and put off practicing, but we always return to it as soon as we can. Makeshift studio in our hotel room, using headphones purchased today at a pawn shop. And Chon is thinking throughout the year about our December gig. We do two to four gigs during the year, and they include my birthday party (June) and Chon’s birthday party (December), New Year’s Eve, and other dates, like Valentine’s Day and Mothers’ Day. 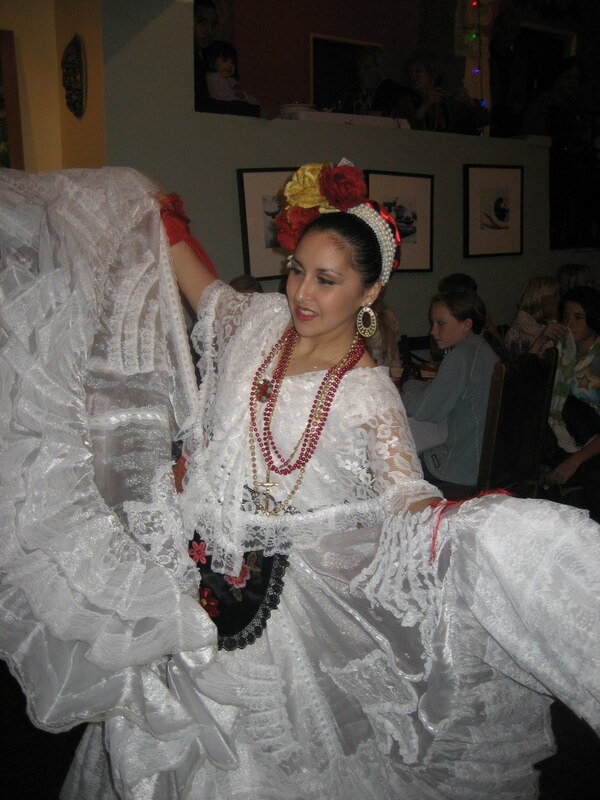 These gigs often include repertoire we plan to use at the Posadas parties. The Posadas dinner parties are held in a restaurant that can accommodate several hundred people. We have played nearly every night of each December 16-24 since 1987. Really. The show is pretty much the same each season. In fact, the manager prints us out the very same show order every year. This year they wrote in an extra group of dances by the folkloric dancers, which might not seem really important, but it turned out to be. And it was a different dance group than the one that we’ve seen every year for many years. Many of the families that attend have made this a family tradition for longer than we’ve been hosting the show. Really! So we see children and grandchildren of those families one night of the year every year. And after so many years, you get a feeling of what to expect each night. Since it is a family-oriented show, you may not have a realistic picture of how the evenings might go. Although there are many small families with charming, wide-eyed children, there are often large families and some pretty wild behavior. Take last night for example. While we were setting up, an ex-student arrived to chat with us. Thanks for coming, Jose!! Planning to stay, he and his friends instead had to leave, there being no room in the inn, ha ha (posadas joke). It was sold out. Our student friend Jose stopped by while we were setting up! When I saw the thin blonde woman walk in, with her extremely high heels and faux leather pants, I knew how it would be. The year before, her large family group had brought confetti-filled egg shells, and throughout the evening had thrown the eggs and hard candies around, one even denting the finish of a guitar onstage. They tend to drink a lot of Margaritas. Who knows – maybe this is their one night of the year to really cut loose! And so they did. There were 25 kids, seated at long tables facing each other on the dance floor, (right in front of us) leaving little room for the marionette show and the dancers. The kids threw confetti eggs at each other, and playfully ground confetti into each others’ hair. Their parents could be seen and heard admonishing the kids, to little avail, although the kids really seemed playful and excited, and not hurtful. We began the evening on time, with some jazzy Christmas carols on the piano. While I played, Chon was fixing the sound to be even better. After the jazzy carols we played and sang Christmas carols in English and Spanish, and then the dancers came to the now-tiny dance floor, a few minutes late. The leader/organizer of the dancers had asked us to let him know when there were two carols left before they began. We told him, but they weren’t quite ready. Christmas carols are not long! They are certainly not as long as a three-minute pop song. We sang two more, and then the dancers entered the crowded dance area and presented some short Aztec dances. They have beautiful costumes and headdresses, rattles, and fire! in a fire pot. Then we played two dance numbers for the audience, one in Spanish and one in English. The kids continued bombarding each other with confetti. Confetti on a polished wood floor seems to make it more slippery but no waiter or waitress bearing large trays of food fell. Then the Bob Baker marionettes show was presented by the talented puppet master, Eric. I love the show, and have not tired of it in all these years. There are clowns, a skating bear, a couple in Mexican folkwear, a tall couple in ballroom dance wear, a tall pink cat with maribou and high heels, little boys, a big yellow chicken that lays an egg on stage. I find it delightful. The kids edged closer and closer to the center, making it difficult for Eric to navigate. The music used for the marionettes is “classic” humorous songs all adults recognize, a Spike Jones number, and even light classical music like Leroy Anderson. Eric has the music on his iPod/iPhone and it’s easy to hook it up to our sound system, but difficult to equalize so that it sounds good through the big speakers. Chon does that well. Recently Eric and Chon have discussed making new recordings of the music so it doesn’t take so much adjusting. After the marionette show we did a Posadas Procession, a shortened version of the Mexican tradition of singing groups of people visiting neighboring houses before Christmas. The kids “help” with this, processing around the restaurant, with the dancers carrying a large Nativity scene. Joseph and Mary seek shelter and the story ends happily. We play live music for this. With so many kids it was difficult to walk around. We followed the procession with more dance music, and then played very brief music for each kid to swing at the piñata (there were two of them, as there were so many kids – the twenty-five seated on the dance floor were joined by others who magically showed up when we announced the piñata. Throughout the evening the dance floor was occasionally taken over by men wearing Mexican gabanes holding glasses – of – beer? It looked like that. They are the ones who like it when we play rock music. And we do. See how eclectic it is? The dancers returned for a dance from the Mexican state of Michoacan, the above-mentioned change in our tried-and-true order of events, and at this point we began to get complaints. They came to me, and not to the manager, so it was a little weird. No, it was odd, and I wasn’t sure what to say. One woman, loudly, said into my ear as I was singing, “The Baldwins are leaving! We were waiting for the Mothers and Sons dance, but we have to go!” As soon as I could, I told her that would be the very next thing. The Michoacan dance dragged on. Aside: the dance from Michoacan is a famous one called Los Viejitos, The Little Old Men, and it’s comical. Or it’s supposed to be. Dancers with masks depicting old men with long pink faces, dance like young men, and fall down, and get up and dance some more, and generally make a nuisance of themselves. To be really good it must have physical humor. It seems mystifying to most of us gringos, however, as it was last night to the audience. I must be missing something. The blonde woman also came to the stage to comment about the Mothers and Sons Dance, and I told her that the program was the same, and it WAS, it really WAS, except for that one little insertion of the Old Men Dance. The blonde woman hissed at me, “NO, it’s NOT”. They know the order of the show! Anyway, it ground to an end, and we were relieved to announce the Mothers and Sons dance. We have often thought about changing the music we play for this, but perhaps we should put that idea out of our heads. Then the Fathers and Daughters danced, and we followed this with the Hokey Pokey, (yes, we really play the Hokey Pokey), La Macarena, and then a melange of mostly original holiday rock music, which has really great energy, and many kids and parents were dancing, including the blonde woman, who at one point put one high-heeled foot up on a table so that her pants slid down in the back and we got a really clear view of a body part usually covered up, and later made some dance moves not usually made on family restaurants. And then it was over. We tore down equipment, packed it up and stowed it, and headed to the Valley. We sat and watched an episode of Anger Management and went to sleep. Our schedule every day of the show – you may think that a three-hour show is just that – three hours. But now you know – there’s practice and planning all year. There is instrument repair and wires repair. There is tuning. We leave to go to the three-hour gig at 4 p.m. We set up for 45 minutes to an hour. We eat. That’s a lucky part, because the food at La Golondrina is really good, and it’s better every year. We play the show. We tear down, and we get back to our non-luxurious hotel aound 11 p.m. When you have that sort of wire-tired feeling you can’t go right to sleep, so you sleep late. Then there is usually enough time to get breakfast or lunch and get ready to go again. It’s great work if you can get it. This entry was posted in Bob Baker Marionettes, border crossing, La Golondrina Restaurant, Olvera Street Christmas, performing musicians, professional musicians show on December 23, 2014 by gubabbaboy.